In the last season of 2018 we exported many cement baskets to Russia and America. Our cement baskets have tow types, slip on canvas type and slip on welded type. Cement basket typically run above weak formations, requiring protection from the pressure, generated by the cement column. Normally installed on the casing string above the weak formation, its design allows cement to flow in an upward direction, yet help to prevent it from falling downward. Cementing baskets are available in hinged or slipon configurations and should be installed over stop collars to prevent axial movement. The slip-on type and the hinged type cement basket can be normally installed between slip-on type stop collars or stop collar or hinged camp over the casing to hold them in a place. They are available in 4 ½” to 20” sizes and any kind of specific sizes. 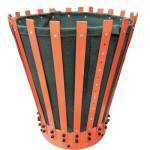 We provide cement basket with very competitive prices and high quality. Our QC team test every unit of finished cement baskets strictly.